We are a small community of Benedictine nuns living in Fabriano, in the monastery of s.Luca that dates back to the XV century. According to our tradition and the monastic wisdom we organize our everyday life following the rules of prayer and work. We are interested to meet new people for a cultural exchange and to open our minds. We welcome to our guesthouse people willing to share our spiritual experience and to help us in the task of mantaining and improving the condition of our house. 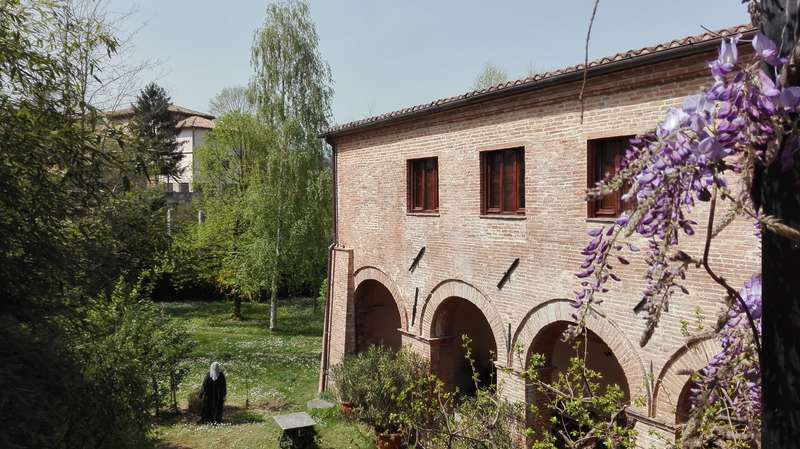 Our monastery, located right in the centre of Fabriano, is quite large and is sorrounded by a park, therefore continuos maintenance is necessary. We welcome to our guesthouse people willing to share our human and spiritual experience and to help us in the task of mantaining and improving the condition of our house. In our monastery there is a guesthouse. Single and double rooms with private bathroom are available. Meals are provided by the kitchen of the monastery. Fabriano is a touristic spot very well known for its ancient paper production dating back to the Middle Age. Around the town there is a lot to be seen, such as the famous Frasassi caves. Assisi is just two hours drive from us. (Eva e Pierre) siamo rimasti due settimane nel monastero in ottobre. L'esperienza era meravigliosa grazie a tante cose, la prima era l'ospitalità e la simpatia delle suore che ci ha fatto sentire un benessere da l'inizio, la seconda era il monastero che è un edificio veramente bello, pieno di storie e rilassante. Il lavoro con Guido e altri… read more Workwayer era interessante, abbiamo lavorato nel giardino ma abbiamo principalmente restaurato qualche vecchie sedie (più di cento anni se non mi sbaglio). Potremmo dire ancora tanto bene sulle suore e il monastero, questa esperienza rimarrà per sempre nei nostri cuori. Grazie per tutto. Eve and Pierre are very mature, reliable, polite and sensible youths. They adapted very well to the context, showing commitment, availability and precision. They helped us with the garden and the nut harvest in the countryside, and they also repaired several chairs. They are calm and tried to communicate (also in Italian) with all the other… read more friends and volunteers. Thank you for your presence, we look forward to having you with us again. Grace came to our cloister with her dear Australian friends, bringing joy, availability and commitment. She helped us in the kitchen every morning and worked every afternoon on translations and woodworking. Besides all these activities, all seriously performed, we would like to highlight her keen interest in us and our lifestyle, stimulated by the… read more need to find answers to her questions. It has been a beautiful friendship and we hope to meet her again and tell each other about our experiences. We will keep these good memories and wish you all the best. Theresa and Lily are two Australian inseparable friends who perfectly adjusted to our life in the cloister. They are excited about knowing the world and relating to new people. They welcomed all our proposals, working carefully and responsibly: they helped us a lot and blessed us every day with their joy, laughs and songs… Theresa and Lily are now… read more making projects for their future life. We therefore wish them good luck and hope we will meet someday. Lots of hugs. Anne Sofie spent 2 weeks with us and she helped us a lot with every small thing we asked her, especially with woodworking. Indeed, she is incredibly skilled at painting! With care and responsibility, she created a calm and cheerful atmosphere among the other “workawayers”. It was honestly a beautiful exchange for us because of her availability and… read more interest in our lifestyle. Goodbye, Anne Sofie! We are waiting for you! I am so grateful to have been so warmly welcomed into this monastery! My two weeks there in September have been filled with love, peace and contemplation, and it has been one of the best things I have ever done for myself. I have met the most beautiful people, the nuns and other workawayers, and I will never forget them! Thar work was light, the… read more nuns and the carpenter was very helpful and sweet despite the fact that I could not speak Italian. But we managed very well to communicate, and I felt very safe doing whatever work they would have me do. Lia is a mature girl so full of life and with a great desire to communicate… Thanks to her open mind, Lia can easily relate to others. He helped us with the garden, woodworking, and the kitchen, adjusting well to the place and cooperating with other volunteers. She also patiently helped out by giving English lessons and shared with our community… read more moments of prayer, always trying to learn and know more. Thank you, Lia for your presence. We are waiting for you. It is simply not possible to say enough kind words about the sisters, the monastery, Fabriano, and my workaway experience here. The monastery itself is beautiful, the accommodations are simple, clean, private and have a gorgeous view (!) The work is very well-defined, hours are regular, the lunch break is long and leisurely. But above all, as… read more others have said, the most wonderful thing about this workaway is truly the hosts themselves. The sisters here are nothing shy of amazing, they welcomed me into their space with such open hearts and minds. You also have the opportunity to meet and talk with people from all over at the lunch and dinner table, practice a couple languages, learn about the culture (and cuisine!) of others, and form relationships with other workawayers. I was absolutely blown away by the diversity of people I encountered from all walks of life here. The town of Fabriano itself is beautiful, old, and all accessible. The monastery is very centrally located so you have access by foot to anything and everything you might need: groceries, pharmacy, post office etc. The surrounding region is beautiful too; I highly recommend touring around Marche and Umbria, there are some beautiful hikes, cities, and pilgrimage towns in the region that shouldn't be missed if possible! My time here was incredible and will not easily be forgotten. Undoubtedly, if you participate in this workaway yours will be too. Thank you for everything and I truly hope to return sooner rather than later! Jack is a very tranquil person, he loves reading, listening to music and spending time silently on his own; he helped us with the garden and maintenance tasks, cooperating with other volunteers. He duly shared our vesper time with the community, even participating in singing activities. We wish you all the best, Jack. Thank you for everything! Listen to what everyone else is saying. This place is pretty close to perfect. You are unlikely to find more of a warm welcome, more of a sweet and peaceful atmosphere, a gentleness and generosity of spirit, more of an enchanting way of life. Eating so much gorgeous fresh fruit and veg from the garden, living in such palatial, pure, flowery… read more surroundings, under porticoes and bowers, doing such wholesome and pleasant outdoor work, meeting such interesting and sweet people, exploring the staggering nearby scenery (Marche's countryside is not to be missed), receiving such kindness and hospitality from the nuns: it all builds up to make your time feel especially precious. I really can't emphasise how happily and gorgeously the time passed in this wonderful place. I really recommend going along to some of the daily services if you can. It was a true privilege to join the nuns for vespers. Thank you sisters, Gudio, and all other guests and workawayers for giving me such a wonderful experience. I was very lucky to come across this wonderful monastery and its community of extremly kind people. I felt at home immediately: the accomodation, the food, and music instruments to play. The work consisted of renovating some furniture and helping in the garden, while in the afternoons I usually tutored a 13 yo boy and assisted him with English.… read more Thank you to all of you for hosting me! It was a great and rewarding experience! I hope to see you soon! Milton is a very mature, polite and responsible guy. He worked patiently and he successfully cooperated with different people. He also capable of working on his own: he’s a hard worker and he helped us with gardening and woodworking. He also helped Giacomo with his English easily building up a good relationship with him. He is been a nice presence in the group and he played guitar and piano and sang very, very well: he has a beautiful voice! We hope there will be other occasions to know each other better! Thank you, Milton and good luck!! Vilma spent fifteen days with us and she’s been very helpful to our community, especially for the sisters she worked with in the kitchen! She was immediately willing to help and enthusiast about her task and she taught us a lot of things cooking delicious meals. Vilma also worked with dedication to restore wood’s manufactures. She always worked… read more with care and sensitivity, she shared many moments of community life praying. She made up a relaxed and friendly atmosphere with the other volunteers and friends. She’s a mature and responsible girl, we wish her well and we hope to see her again, it would be a pleasure! Thanks Vilma!! Clara spent just fifteen days with us but she immediately fitted into the context of the monastery. She was in charge of helping in the kitchen and restoring wood’s manufactures: she worked with great accuracy, responsibility, and passion and she did a very good job! She’s a very sociable, careful and sensible girl. She proved to be mature and a… read more well-organized team worker. A special thank you, Clara, and see you soon! We’ll wait for you to come back! Nathalie spent a short time with us bit she did an important transcription work at the pc, which she accomplished carefully and with great accuracy. Thank you Nathalie for your dedication!! Bye! I don't know what to say that hasn't already been said about this wonderful place and lovely nuns. I really enjoyed my stay with them. Everything was perfect. Antonio was at his first experience as workawayers but from immediately he inserted very well at the monastery and moved with great attention and discretion. He was very responsible and reliable boy, a hard worker. He learned new things with a lot of facilities because he knew how to listen. He was ready to help anyone, madre Battista in… read more particular: he took care of her plants. Good in the relationships with the other volunteers and with the guests, he was patient and available… and he “conquered” the little Angelo, a child who was our guest only two days, playing football with him. Thank you, a lot Antonio for your help and your friendship: we wait for you next year! I think it is difficult to summarize in a few lines of a review all the emotions and feelings experienced during the two weeks spent in this monastery, but I'll try. This was my first experience with Workaway and what can I say except: WONDERFUL!!! Everything was just perfect, so much so that it was really hard to say goodbye to everyone and… read more leave. The welcome from Mother Laura and the other sisters was warm, I felt immediately at ease. The relationship between the workawayers and the guests of the guesthouse was amazing, as well as the relationship with Guido, who takes care of volunteers in daily work. I would like to briefly describe the typical day. The morning work starts at 9 and ends at 12, followed by lunch; we resume working at 2 pm and finish at 4 pm. All for five days a week (the weekend is free). The jobs are varied, all rather light or medium-intensity, ranging from garden care to furniture restoration (nothing complicated), as well as help in the kitchen. The thing that most impressed me and the other workawayers with whom I shared this experience is the perfect balance between work and free time, which made the days run slowly and at the same time quickly (unfortunately). A fantastic feeling, as well as waking up and listening to the beautiful voices of the sisters sing the morning praise. Moreover, the fact that the Monastery is attended by workawayers from all over the world, makes the environment international, stimulating and excellent for those who want or need to practice English. 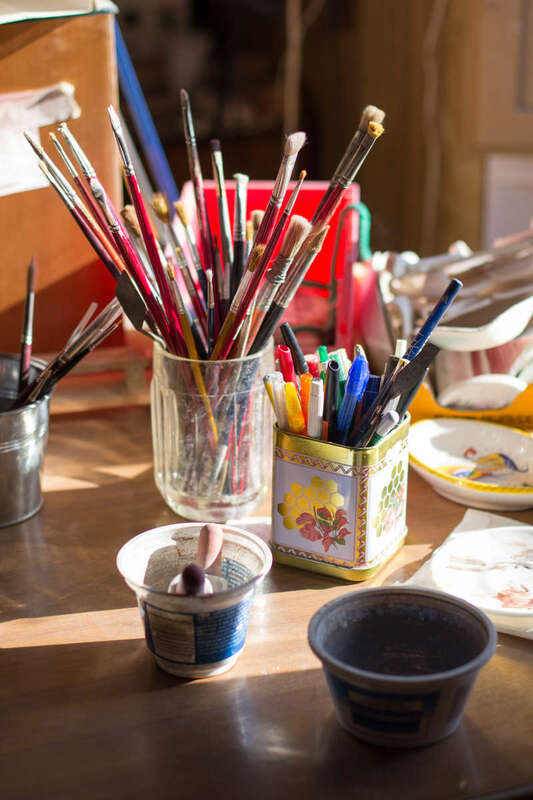 In your free time you can visit Fabriano, get lost in its streets full of colors and smells, visit the Museum of Paper (Fabriano is famous for this product) or that of the bicycle, or even the Civic Art Gallery, all very close to the Monastery. Or, taking train and / or bus, it is possible to reach the near Umbria (in particular Gubbio, Assisi, Perugia), or spend a day at the seaside (it is only one hour by train). Very close also the caves of Frasassi, reachable by train. In conclusion, I give five stars only because it is not possible to give a greater mark, and I thank Mother Laura, Mother Baptist, all the sisters and Guido for the time spent together and for all that you have taught and left me. See you soon :D !!! Laci has been with us a cheerful presence, always smiling and available for every in demand job. With great patience she has helped us in the garden, to restore furniture in the maintenance of the guesthouse. She has shared many moments of our community life always trying to understand our style of life. With regard to interpersonal relations,… read more Laci was attentive and affectionate to the monastery guests, with the other workawayers, and also with us. Let's hope to still entertain you Laci: thanks of heart for everything! And thanks a lot to Noah: we wish to still meet him! The Monastero was everything I expected it to be and much more. After reading other Workaway experiences my expectations were quite high. My personal goal was to find peace and rest away from the chaos of my personal life. I also greatly desired spiritual refreshment. My expectations were met exceedingly. I spent three weeks at the Monastero and… read more within days I felt at home. The environment is a safe haven... a sanctuary. I felt safe, loved, valued. I also felt like I was able to have the space and time I needed to really work some personal things out. The Nuns were so loving, so kind. I felt adored and unconditionally loved. The way they care for each others, strangers, plants and animals was more impactful than they'll ever know. They are the closest thing to love that I've experienced so far. And I aspire to live a life of love, hard work, hospitality and prayer just as they exemplify. I am forever changed. The work was really good. I loved the schedule. It created the structure I needed to feel safe and at home. I did quite a bit of gardening: weeding, trimming, clearing, watering plants. I also did quite a few odd jobs, sweeping, mopping, writing and origami! I also worked in the afternoons with Guido on furniture: sanding, polishing, treating 500 year old desks... no big deal. :) I had great fun with Guido, he is a feisty one. The work really gives you time to be alone with yourself, to process and think. And being so far from home plenty of stuff was able to surface that I was ready to face and pray through. I greatly enjoyed the work. The other Workawayers I was able to meet made the experience even better. I made a few friends I'll stay connected to for life! I had plenty of free time to explore Fabriano. It was so beautiful, simple, peaceful. I spent most of my free time exploring the streets, shops, pizza places and coffee shops. I even got to explore some of the hillside. Madre Laura, Madre Battista, Lucia, Gabriella, Paula, Sicilia, Teresa... and so many more. Thank you so much for taking me in with open arms. Thank you for loving on me so well. The Monastero San Luca will always be in my heart and in my prayers. My first Workaway experience will tough to beat. I'm definitely planning on my return to the Monastero in Fabriano, Italy! Cammie appeared very interested in our spiritual and desirous life to share our daily rhythm, inserting herself with discretion and with simplicity. She immediately tied with the volunteers and the friends of the guesthouse and with all the nuns. 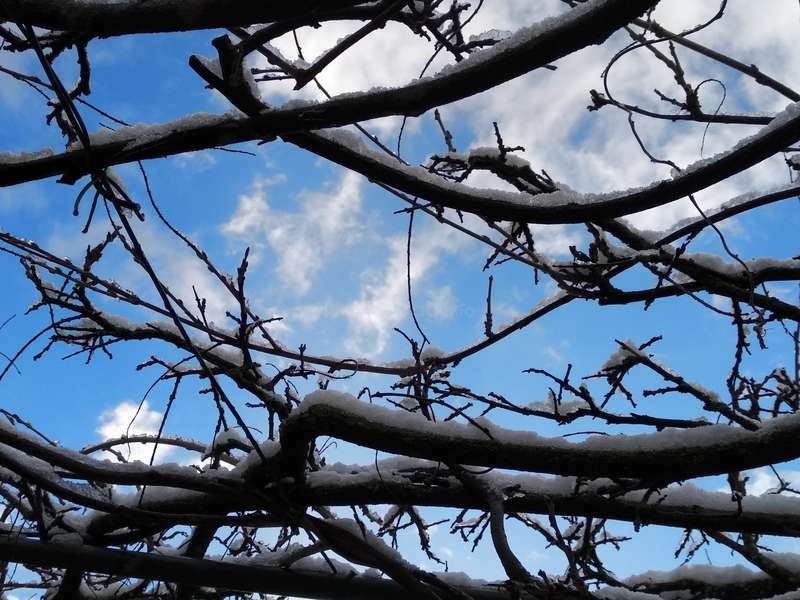 Her help was precious in tailoring: She managed herself with an ability to plan and to realize suits… read more for the nuns. It was a beautiful and important experience of sharing. Let's hope to have other occasions as we meet Cammie! We remember you and we wish you all the best for your future projects! Thanks for everything. 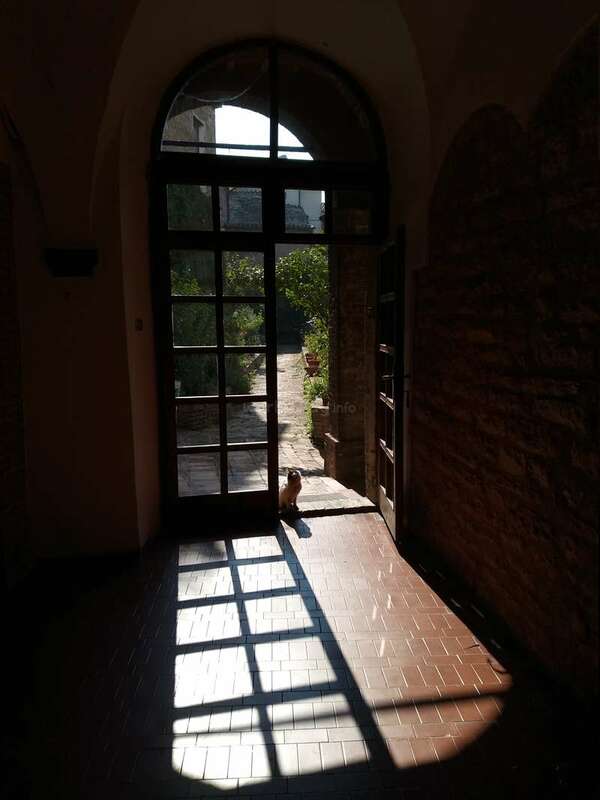 It's now basically three weeks that I left and I think no day has passed where I haven't fondly remembered the time I spent at the monastery in Fabriano. The monastery itself is an amazing place that is made only more special by its inhabitants: it was really a pleasure to get to know the sisters, to be hear their beautiful singing during vespri… read more and to get a small insight into their everyday life. I can only say: Grazie a voi tutte per la vostra ospitalità, e generosità e che avete sempre un sorriso sulla faccia. Working alongside Guido (grazie anche a te, Guido) was always rewarding and I gained a lot of new skills: from woodworking to hoeing potatoes, though I particularly enjoyed working in the vast and most beautiful gardens of the monastery. I can only add once more: thank you for everything and I hope I'll be back soon! Julia is a lively girl, with excellent knowledge of Italian, which we all enjoyed. She worked hard in the garden, in wood restoration and was always available for any new project. Very sociable, she proved to be mature and a capable team worker. A special thank you and... see you soon! Abbie is a girl with great sensitivity, a beautiful character, smiling and sociable. She easily learns any job and is able to do it perfectly: she learned to take care of the garden, to restore wood furniture and even to hoe the potatoes! She participated in community prayer and expressed interest in learning about our monastic life. We hope to… read more see you again! Thanks Abbie! My 3 weeks at the monastery are one of my most amazing travel experiences. I am so grateful for having meet such happy, loving and kindhearted people. No words would do justice describing the warmth and kindness you meet this place. I enjoyed participating in the sister's prayers, listening to their beautiful voices and experiencing the love and… read more peacefulness they all spread. Meeting such wisdom, compassion, patience, generosity, humbleness and understanding in one place, is what makes this workaway experience incredibly unique and unforgettable. The monastery it self is beautiful, the gardens are magical and all so well kept. Fabriano is a hidden historical treasure, surrounded by mountains and has several stunning hikes. The work is enjoyable and divers. I loved working in the garden and I so enjoyed working with Guido, the handyman at the monastery. I will miss all of the sisters and Guido so very much. And I will definitely come back to visit them again. Alex is a very reliable and sensible guy. He worked primarily in the garden, using a machine to compost and on some general maintenance projects. He also enjoyed participating in our spiritual activities. He also contributed to a cordial and relaxed environment with guest and other volunteers. Alex, your Italian is amazing! We are waiting for your… read more return! Thanks for your friendship! Best wishes for everything! Wonderful experience with wonderful people. I learned a lot working with Guido in the garden (using a weedwacker, wood chipper, etc) and how to sand and varnish furniture. I also loved to participate in the sisters' prayers because their singing voices fill your spirit in an incredible way. The sisters are wise, compassionate, understanding, and… read more kind to everyone. Good eats and great conversation at the table with the other workawayers. Thank you for this eye-opening experience and helping me along my spiritual journey with God. Siete bravissime e tornerò fra poco! Mary Lou was friendly and open. She worked very responsibly, helping us in the kitchen and also with English language practice. She is a fantastic woman with a lot of life experience, easily adapts to new situations and welcomes the opportunity to meet new people. We were happy to host her and hope to see her again. Thanks Mary Lou! My three weeks at the Monastery were a wonderful experience. The sisters were so kind, welcoming, and fun! The buildings and gardens are beautiful, and provided a wonderful backdrop for reflection, reading and relaxing. And then the town of Fabriano itself is very interesting with some great museums, parks, markets, and gelato. The work at the… read more monastery was varied--I worked in the kitchen, the gardens, and taught a few English lessons. There were other workawayers and often visitors around the dining table where we enjoyed lots of good food. A great mix of languages and cultures, so always interesting. I highly recommed this workaway if you are looking for a a beautiful, quiet place to be of service and meet wonderful people. Jasmine has been with us and has worked very carefully and willingly (wood restoration, gardening, cleaning). In the guesthouse she easily has interacted with other volunteers and guests. We thank you, wishing you every good, hoping to see her other again! I stayed at the monostary for just under 2 weeks in May. It was my first workaway and was a great experience! The work was 5 hours a day and I did a mix of gardening and helping to restore furniture. Not too difficult! We were provided with very tasty meals for lunch and dinner and the sisters very kindly accommodated me being vegetarian also. I… read more stayed at the same time as other workawayers and it was great to get to know them too. We did not eat with the sisters but in a separate area for guests. Very often we were joined at mealtimes with other guests of the monostary which I found really nice and interesting as we learnt more about Italy and life there from these people. I found being in fabriano to also be extremely peaceful. It is a nice little Italian town with great ice cream! Last but not least the sisters were so lovely and kind and always keen to help! Thank you for a wonderful time! Sam and Abbie have been with us 15 days and they have helped us in many areas: to rearrange cabinets for the home, to clean up cloister and garden, in the countryside to cut wood. They were discreet and available to talk with other volunteers. Sam is a reliable and skilled guy in many jobs and Abbie has proved to be a talented painter! A reliable, silent, respectful and attentive boy, German worked with energy as a carpenter. He was able to collaborate and be willing to learn with 2 carpenters that came here like guests. Very nice person! We wait for you again German. Thanks! I am glad that I visited such a beautiful place and met with such amazing people. In addition, I was able to work with two great carpenters who came to the monastery to help with the repair and restoration of furniture. I have gained invaluable experience and learned a lot. Thanks Laura and the other sisters for their warm hospitality.… read more Unforgettable journey. Generous, friendly, sociable, Daniel & Alinne have worked hard with us. They also helped us in the countryside to cut wood. Dismounting cabinets, moving closets, installing cabinets... Daniel has become very good! We asked him to do many thing and he was always ready. Alinne has patience, attention and was a great help in the kitchen and able to… read more adapt to every job. We thank you for your help and friendship! Our experience here was totally amazing! Only one nun there speaks English so be prepared to speak and be given instructions in Italian. Our Italian improved immensely during our two weeks there. The nuns are very helpful, always asking if you need something and they will feed you well! Alinne enjoyed working in the kitchen, where you can have… read more great conversations with different nuns, learn local dishes and have fun moments. They have great stories and a huge knowledge, that they love share with you. Daniel mostly worked with Guido, the groundskeeper of the monastery. They give you the weekends off which we used to explore nearby cities like Assisi, Gubbio, and Ancona. It was amazing to experience monastic life and probably one of the most fulfilling Workaways we've had. Our experience with Kate was nice and positive (we hope she returns to stay with us again!). She is a mature girl, very reliable in the services requested of her in the guesthouse and kitchen. Kate is very sensible, discrete and reseved, caring in her relationship. She also helped as an english teacher (giving lessons to Giacomo), always available… read more with semplicity and competence. We wish her luck as she enters a new part of the world. I stayed here for two weeks this February and am so grateful to have had this experience! During those two weeks I worked in the kitchens in the mornings and helped tutor a local student in English every other afternoon. The work was clearly defined and felt rewarding. When I was not working I had a substantial amount of free time which I used to… read more take long passeggiatas through Fabriano, read, and drink tea/eat cookies in the guest kitchen. One weekend I took a day trip to Ancona, the nearby port town, and had a great time at the park eating fried seafood! Mother Maria Laura, all of the sisters, and the staff that I worked with (Rosa and Mila) were incredibly welcoming and caring. I ate well (maybe too well) at every meal and was invited to participate in the spiritual life of the monastery. Thank you all for your hospitality and openness! I will remember this time for the rest of my life. Sofia è molto interessata alla cultura italiana (e al sole! ), aperta di mente, sorridente e una vera lavoratrice! Con gli altri volontari ha restaurato benissimo il grande portone della chiesa e alcuni piccoli mobili . Molto disponibile a creare un clima sereno è stata con noi discreta e sempre molto attenta. Speriamo davvero di poterla… read more accogliere ancora. Grazie Sofia! Sofia is very much interested in Italian culture (and Italian sunny weather! ), she is very open minded, cheerful and a great worker! Together with the other volunteers she did a great job in restoring the church big door and some pieces of furniture. She was always ready to help in establishing a serene ambient and was always delicate and attentive to us. We hope we can have her with us again, thank you, Sofia! Sveta spent three weeks with us and helped us mainly in the kitchen, by carrying out with diligence the morning shift. She also worked with the other volunteers to other tasks (especially woodworking) and she proved very precise, she has in fact very manual skilled. Sveta is very quiet and she adapted well to the daily routine, spending her free… read more time walking alone for hours. All the best and thank you, Sveta! We wish her all the best in… read more her studies, see you later! Jean is a gentle young man, autonomous and precise in his work. He was willing to help in different tasks such as woodworking, gardening… Jean is a sportman with a calm and serene personality and he befriends easily by adjusting to different situations. Thanks again! If you happen to cycle around here again, please come and see us! Dan readily replayed to our invitation to come over, even if it came very last minute. He is a very organized and independent young man, always cheerful and eager to face whatever task, no matter how difficult or unexpected! He was really helpful with masonry and he worked dutyfully. He is great in engaging and encouraging other volunteers so that… read more they work enthusiastically. In his free time he is a great talker or reads, so that the ambient in the guest quarter was always pleasant and relaxed. Amy was a reliable and efficient helper in the kitchen; though she was not experienced in that field, she willingly accepted to work there and quickly learned her tasks by observing with determination. In the afternoons she happily worked together with the other volunteers. She is a lively girl, always eager to learn new things. Bye Amy and thanks… read more a lot! Cintia and Jonatan are a mature well mannered couple very eager to carry out whatever task with great diligence. They fit in very well with the group and helped crating a friendly atmosphere with everybody and working with great diligence during three weeks they spent with us. Jonatan and Cintia are great workers, they are very patient. It was… read more great to have them with us and we hope we can meet again in the future. Warm regards and thank you! We are happy to have met this wonderful place. The sisters welcomed us with much love and kindness. For three weeks we share our time and our help in an atmosphere of harmony and tranquility. Thank you sisters for giving us the opportunity to know your home and your choice of life. We will definitely return to the beautiful Fabriano. Cecilia has got a contagious energy, which she spreads around by her smile and her eagerness to fulfill the various tasks with responsibility. She is interested in a lot of things and she is always attentive to the most difficult situations. She befriends easily and establishes positive relationships. My stay in the monastery was magical. I felt very connected to the place. The nouns I have met were all intelligent, sensitive and sweet. They treated me with love and were patient and always ready to give me their advice and warm words. The work was varied: from painting and cleaning to helping an amazing boy with his homework. I will remember… read more all the people I met there for the rest of my life. I recommend this place to anyone who loves peace and enjoys with amazing energy. Thanks so much, Madre Laura, and all of you! Maria and Teresa are two great sisters, quiet, responsible, one different from the other but both very accomodating. They are very cheerful they are fluent in written and spoken Italian. They helped creating a great ambient in the workawayers’ group by promoting work together with social activities. Maria experienced working in the kitchen and… read more showed great interest in our way of life by taking part in our prayer time, whereas Teresa was always ready for physical tasks, and she switched easily from woodworking to coating. We hope we’ll have the opportunity to meet again and we wish them to keep on pursuing their goals in life with enthusiasm. Thanks!!! I had an absolutely wonderful time at San Luca, and will treasure my memories dearly. As soon as I arrived I felt welcomed and part of this amazing community that easily gained my respect during my 4-week stay. My tasks mainly involved helping in the kitchen and helping a young student with his holiday homework, but I also spent time working with… read more Guido and the other workawayers doing things such as sanding, painting and varnishing windows. I also helped to make jam a few times! The work was never strenuous, and in any case there was always plenty of free time to relax, explore the town and socialise with the other workawayers. At the weekends we often went together on day trips to different towns (and once to the beach! ), which were easily reached by train from Fabriano. A couple of times we also went for walks in the nearby countryside, which is lovely and very picturesque. But my time spent with the nuns was definitely the most treasured part of my stay. Most evenings I went to Vespers (the evening prayer), which was a tranquil and peaceful end to the day, and since I was fortunate enough to work in the kitchen, I was able to talk more easily to the nuns and make good friends with several of them. We had a nice and one-month long experience with Alice, a reliable, accurate, gentle, careful, cheerful girl. Alice immediately responded responsibly to the request for a cultural exchange with a young student and his homeworks for the summer, and she committed herself to help in the kitchen. She proved to be precious and discreet, autonomous in… read more living in solitude and in company during her free time. She made friends with the monastery's guests and she met many friendly people. She shared her experience with other workawayers and she made great progress in the Italian study, that she understands and speaks at an excellent level. For her ongoing studies it will surely be good! Alice, we look forward and hope to meet you again. Thanks!! How lucky I was to be accepted by Laura for my first workaway experience. Everything turned out to be more than I expected. I learned so much about myself, the Benedictine sisters, monks, and people from other parts of the world. The sisters are so amazing. I was fascinated by their simple way of life, and I felt so much love radiating from them… read more that I felt like part of their family. I learned how to sand, paint, and varnish windows with Guido, who is a very funny and genuine guy. I saw Lucia the most, out of all the sisters, and she's always made me smile and laugh with her great sense of humor and huge heart. The conversations with Battista gave my friend Laura and I a deeper insight into God, religion, philosophy, prayer, honest work, love and the importance of our connection to God . She is well-known, so people come from all over to speak with her. I feel so much appreciation that I had that opportunity. I attended their vespers, which was my first time going to one, and what beautiful voices they have. There were many times, where I was listening to them and tears welled up in my eyes. I also had a chance to give reiki to one of the nuns, who is 102 years old, and what a nice experience that was. I made so many friends there in such a short amount of time. I even met people in the city center of Fabriano and we also became friends. I have to also thank the kitchen staff for making such good food and making excellent vegetarian food for me. Also, I woke up each morning looking forward to spending some time in their lovely garden, where I gained many lessons just by sitting amongst the chirping birds, listening to the rustling of the leaves, smelling the flowers and herbs, feeling the warm sun on my skin, and feeling the wet grass beneath my bare feet. Thank you for everything!!! Erica is a very friendly girl, always eager to learn and ready to focus on work. She showed interest in our life experience and asked some questions and took part in our liturgy. She was ready to share her ability, particularly with our old nun. She stayed with us for 15 days to practice and improve her Italian. She easily got involved into the… read more group of workawaiers and spent a lot of her free time with them. She made friends with the guests too. We wish her to find good opportunities for a serene life. Thanks! Simon and Ema are both very responsible, careful, reserved and easy to get along with. They are a nice couple who stayed with us two weeks sharing our way of life. They were interested in knowing new things and people therefore they were available and careful from the very beginning. Whoever got in contact with them got on very well because they… read more are both very kind, calm and serene, always ready to listen and know everyone they met: nuns, volunteers and guests. Simon worked intelligently and Ema was a very valuable kitchen aid. They were always helpful and worked with accuracy and reliability. Thank you so much for your time and your respectful friendship. We will you all the best. Ciao! Luisa is a young but very reliable and mature girl who knows and speaks a little Italian. This immediately made us very happy and made us hope for an easy communication with her. She performed the various tasks with care, precision and patience, working alone or with other workawayers. She is a person capable of staying alone as well as having… read more relationships with peers and even with older people, sharing her work and time with them. We thank you for your help and wish you all the best for the future. Laura is a mature girl for her life experience and she came to us after a short course in theological studies in Italy. This encounter proved to be a real surprise, and it was a very intense experience for us because we were able to dialogue on multiple levels, sharing the experience of faith and community prayer. 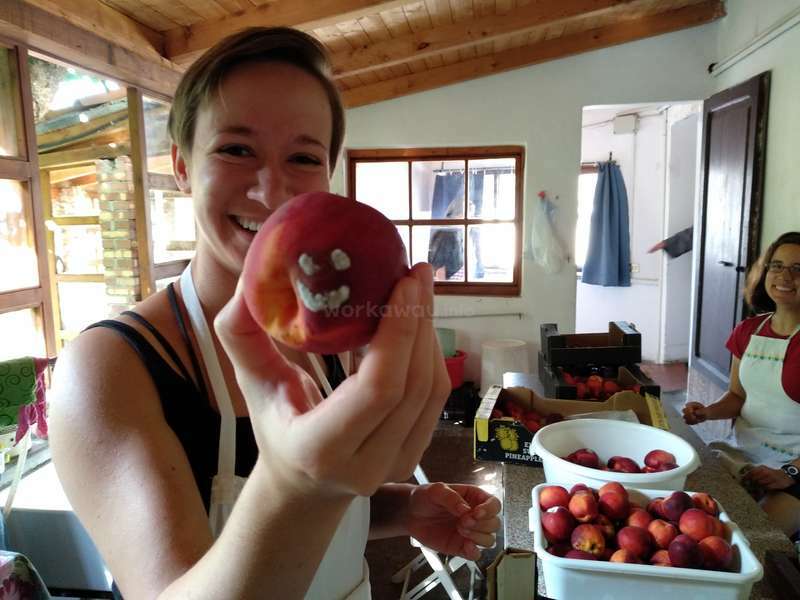 Laura worked with availability… read more and generosity, but above all was an important presence to improve the workawayers group's good atmosphere She made friends with the monastery's guests too and oftens spent her free time with them. But when she could, often she went for long walks. Thank you Laura! A great wish to continue your research journey and hope to see you again! I do not have words to express my happiness and gratitude in being part of the family for 3 weeks. The work was very interesting, sanding, renovating and painting furniture. I really felt like I was making a contribution and being a part of something bigger, in a place that has existed for hundreds of years. This was my first workaway experience and I think I couldn't have asked for a better start. Thanks for all the love and good times, Madre Laura, Lucia, Erica, and all the other nuns, who always had a smile when we crossed paths in the corridors. Also my fellow workawayera, with whom I shared many great conversations and movie sessions after dinner! I shall never forget you and the monastery. I hope I can return very soon! Fabio is a real gentleman, a mature person, smiling and very responsible. He immediately got on very well with everybody, either the monastery's guests or with all of the workawayers that were his "adventure pals". Fabio is discreet and respectful, he loves manual labor and has performed carefully and consistently any jobs entrusted to him, nicely… read more collaborating with the group. 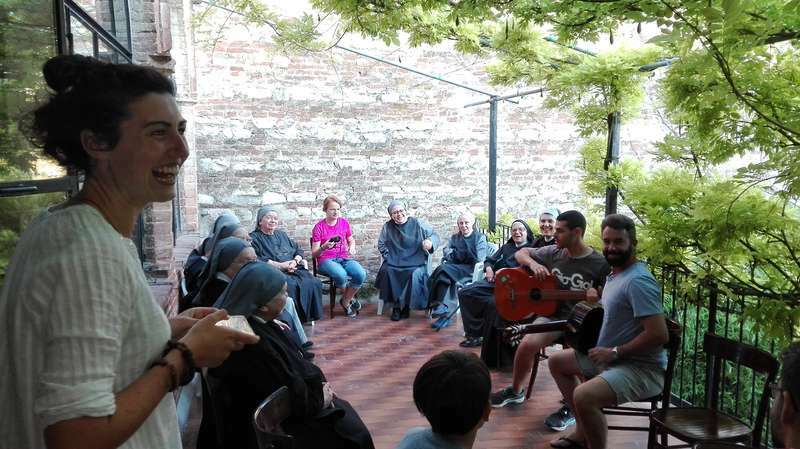 Fabio was a reassuring and relaxing presence at the monastery, and in his free time he enjoyed playing the guitar (we enjoyed his gig with Riccardo, the other guitarist). We thank him and we hope there will be further opportunities to meet. All the best! Riccardo is young but he is a very responsabile boy who pays dutiful attention to every little thing. He is very sensitive and very gracious and kind with everyone. Riccardo has a lot of common sense and behaves with simplicity obtaining good results in different situations of everyday life. He worked well, learning how to do new things because he… read more is able to listen to the instructions for a new job. He is Passionate about music, he plays the guitar very well and he likes to share his passion (great guitars performances with Fabio!). We wish you a good start for your university studies, hoping to see you again! Bye Bye Riccardo and thank you! What an absolute gift it was to stay at the Monastery!! The sisters and madres were so kind, accommodating, and just such a joy to be around. And, of course, the food is just divine!! 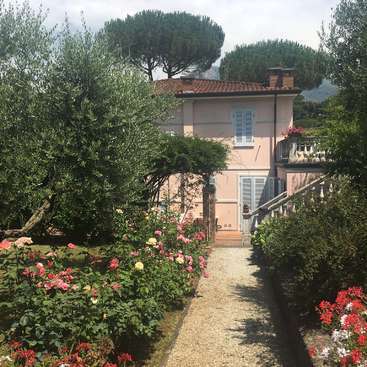 I have so many fond memories of this place and I can't wait to return someday soon but for now I say "a dopo" to the most amazing group of women I've had the… read more pleasure of spending time with!!! What a fantastic girl Anna is! She is a young, joyous girl, yet thoughtful and always capable of creating the best atmosphere in a group. She is energetic and has worked at high speed and paying great attention everywhere, she is really tireless and a very hard worker. She is highly organized, therefore she is able to manage every step in the task… read more she is in care of in a very autonomous and responsible way; moreover communication is never a problem with her, whatever language you use. Either in Italian or English it is her formidable intuition that enables her to pick up every single detail. Whenever we asked for her help, either in the kitchen, in the garden, with maintenance work or cleaning, her prompt reply was always “Ok, perfect!”. In her spare time she engages in creative writing, describing life in general and her life experiences. Anna is a fine writer because she is an acute reader: she observes life and people with great respect and an open mind. We wish her to treasure her precious talent. Goodbye Anna, thank you very much for everything! Slawek is a physically strong guy, who can do any work with care and accuracy. He has always tried to communicate in italian at work and during other times of the day because he wants to learn italian an so, in only 2 weeks he spoke italian with us. Slawek is a quiet person, with listening ability, willing, reliable, studious. He is a guy full of… read more interests and ranges from the good italian food to watercolour. He has woven good relations with everyone (nuns, workawayers, guests) thanks to his very open character. Thank you very much for your help and presence among us! Greetings for the future and for your projects! Natascha is an interesting, nice, girl with a lot of energy. She stayed with us for 2 weeks and she was discreet, quiet, available. She worked always with commitment and she was a good worker in the maintenance of the wood: she sanded and painted the legs of many tables in our guesthouse. She loves running and in her free time she spent often her… read more energy to practise it. She was a nice presence among us to whom we are grateful! The nuns are very nice, lovely, friendly, helpful and good cooks. The monastery is beautiful and peaceful. Fabriano is a nice little city with great parks. Charlotte is a very responsible and reliable girl. With her we tried our first helping in the kitchen and it was a success! In fact, she is a very practical, helpful and discreet person and so, she helped to keep a calm and serene climate. In the afternoon Charlotte sometimes worked in the garden, sometimes at maintenance of old wood, sometimes at… read more reorder. In the guesthouse she easily interacted with other volunteers and guests. A Really smart and mature person! A great wish for your journey and goodbye! Tibor spent with us 2 weeks and he helped us in different necessary works. He (has proved to be very available and adaptable) was very available and adaptable boy. He is cute and smart, discreet and moderate. He doesn't have any problem to collaborate with the other workawayers: the relationships are good for him. He loves the outdoor activities,… read more gym and the good italian food! Thanks Tibor and we wish you every good! I am so happy and grateful that the Nuns replied to my request! They were the first to reply, so i booked the ticket to Rome, and than took the train to Fabriano... What an amazing, truly authentic place to be! I loved it! The monastery is in the centre of the city, with breathtaking views of the surrounding hills and mountains. The region Marche… read more and Umbria offer so many things to see and do, you can not imagine!! It became my favourite part of Italy. Accomodation was excellent, food was plentiful and delicious. The Nuns are very friendly, peaceful community, very calming to be around them. Work for me was very satisfying as i was looking for new experiences coming from a 9-5 office job... still could handle all the gardening and renovating old furniture and doors. Thank you Madre Laura, Lucia and everybody at the monastery. God bless you, i hope i can come back again some time in the future. Agustina was with us for 2 weeks and in this time she worked with responsibility and care. She adapted herself to all jobs: she helped us to clean the guesthouse and the external passages, to sand the windows with patient and she taught spanish and english. She is a good teacher! ...but she made really good all things! She is a mature and reliable… read more girl. She is a reflective person and she loves to read but when she was with the other people (guests, workawayers, nuns) she was also very friendly and open mind in the relationships. 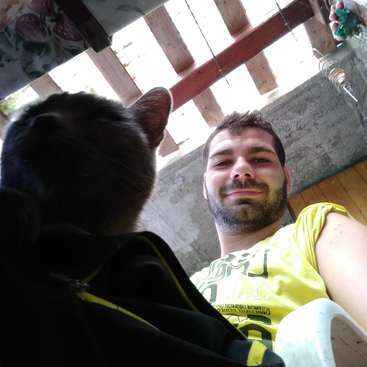 Matthieu is an interesting and solar person, with a lot of questions about life and eager to learn new things. He worked with great availability and adaptability in the garden and in the maintenance of the windows. He made all works with quiet and reliability: he is a boy with capability of listening not only the necessary instructions for the job but also the environment in which he lives. He has easily collaborated with other volunteers and has been pleasing in the relationship with the other guests, creating a serene atmosphere in the guesthouse. Thank you so much for you time spent between us! There is no way that I could have possibly imagined a more fulfilling or more genuine stay with the nuns in the monastery. In my earliest exchanges with Madre Laura I explained that I am not Catholic and asked whether I could still come. The answer was yes of course. Then about a week into my stay at the monastery the workawayers and nuns were… read more able to all sit down together and have a beautiful conversation where we got to know each other. During this conversation I shared that I am Jewish. I had been hesitant to share this information with them at first, but it was clear that our differences of faith did not matter at all. I have so much to say about my stay at the monastery, but what sticks with me the most is the warmth of these women. I traveled by myself throughout Europe for three months. Fabriano was my first stop and it was the best possible place to start my journey. I was treated with such kindness and love that I found myself crying when I had to say goodbye. I also made very dear connections with the other workawayers. For the first half of my stay there were only about 4 or 5 of us at a time, and we all became quite close. Later on in my stay, more and more workawayers kept coming. The two experiences were totally different but equally fun and fulfilling. One of the best things about my time at the monastery was getting to know a little bit about the nuns' lives before they entered the monastery. They are so open and willing to share with you, and give you any time that they have, all you have to do is ask. There is so much more praise I could heap upon these women, I have nothing but good things to say about each of them. Possibly the most impressive thing about the nuns was their desire for us to get the most our of our time there. More than worrying about us working our exact five hours a day, they wanted us to be able to enjoy and explore their part of the world. On more than one occasion we were allowed to stop work early to enjoy a beautiful day or go for a hike in the countryside. You would be lucky to stay at the monastery, take advantage of the grace and wisdom of these women! Sophie is very open minded, consciencious, grateful, tender, always willing to know different ways of lives and approaching every new experience respectfully and discreetly. She is eager to live profoundly and passionately every moment of her life and she wants to learn to embrace the novelties. She is a hard worker and she worked in carpentry… read more with accuracy and precision, easily contributing to help other workawayers. She was always very attentive to different situations and people's needs, so succeeding in establishing realtions in spite of some language problems. During the last days of her stay she photographed some details of the monastery and portrayed her workawayers mates at work: she is an excellent photographer, taking picture being one of her jobs and passions. Thank you very much for your work and especially for your friendship, Sophie. All the best in the future! The time I spent in Fabriano was the most impressive and most unique experience I ever made! Since I am back I am thinking about that peaceful place everyday. I am so grateful that Mother Laura gave me opportunity to stay with them for three lovely weeks! Sanding chairs was something I really enjoyed because I saw the difference we made after… read more working on them for a day. And at the end of my stay seeing all those finished chairs made me happy because I saw all the work the workawayers put into them and it made me proud because I was a part of it. It is fantastic to work for so great people that really appreciate your work every single day! A big thank you for answering all of my quite personal questions during the get-together and also for the fanatastic meals! Seeing all of you smiling at us everyday and at Vespri made me feel welcome and so full of joy. Also I met so many people from all over the world and we got along so well which was fantastic and I made really great friends! Thank you for everything that you did for us! So a big THANK YOU to every single nun! I wish you all the best and I'd love to return next year! Martha stayed with us for long, she is a lively young woman who works hard. She arrived perfectly equipped to work and faced every task with a very practical touch, always impressing us with ingenious solutions that could be even patented (i.e. an incredible plastic-coated t-shirt and bonnet very handy when painting). She is very creative and… read more skillful in everything connected with art and she shared this passion with Livia and Molly. Together they were able to create a nice present for every nun! Martha is very friendly and willing to know new things and situations, she thinks things over, she’s always curious. She is always nice with everybody and she faced brilliantly also the ordeal of the earthquake! Thank you Martha, we wish you all the best! Molly was our last guest before the winter break. She arrived at the end, after a change of plans and at first she was unsure about her accomodation. Nonetheless, she did her best to know the environment and she eventually fit in very well in the community and with Livia and Martha. They ended up very good companions in the adventure… yes it… read more turned out it was an adventure, due to the earthquake. Molly is a very reliable girl, who worked very well and never backed away, so that she contributed very much in creating a warm atmosphere. Bye bye Molly and thank you! Livia is a wise girl who fit in immediately and very well with the workawayer’s group, thus actively taking part in any activities. She worked with commitment and patience, engaging herself very seriously also in works that had not been done properly before, in order to achieve perfection. She is actually very accurate. She was eager to know our… read more daily routine, but also very concerned not to disturb our community. She shared with Martha and Molly many activities together with many experiences, also the bad and unexpected one of the earthquake, right at the end of her stay, but we hope she will carry with her the good memories of the happy days we spent together. A big hug Livia and thank you! Fabriano is a lovely little town and the monastery is… read more only a few steps away from the main piazza. There was a regular market on Saturdays. You can easily visit places like Assisi or Perugia, they are about 1.5 - 2 hours away by train. If you love nature, you can have a walk to the outskirts of Fabriano and see the beautiful views over the Marche hills. I also enjoyed getting lost in the town and sampling the local gelato with the lovely workawayers from the monastery. I am so grateful for all the friendships with other workawayers, I felt like we had known each other for a long time! The food in the monastery was great, I enjoyed every single meal we were served, especially the carciofi and melanzane! The days were really well organised, we always knew what was happening. 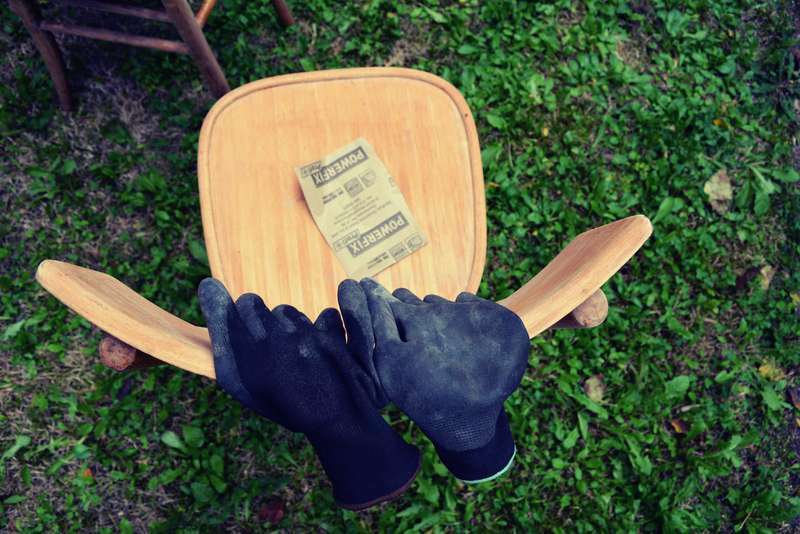 We were usually sanding chairs – something I had never done before. It filled me with pride and joy to see a chair that I sanded, bringing it back to the beginning, to its raw wooden form. One day I spent working with the nuns making little scatolini, which I really enjoyed – thank you for listening to my scrambled Italian! The nuns also sat down with all of us one evening and let us have a peek into their lives and ask questions. They were interested in us just as much as we were interested in them and I felt a special connection among all of us as people- regardless of our age, origin or religious beliefs. We would sometimes join the nuns at the Vespri, which was a very calming and enriching experience. There is something very reassuring about the fact that they do this every day at the same time. I often come back to the church in my thoughts at the time when I know they are praying. I spent three marvellous weeks at the monastery which will stay with me for a lifetime. I arrived on a rainy Sunday evening, and Mother Laura was already waiting at the gate to show me to my room. Fabriano is a picturesque small town, with cobbled street, a town square, and a tradition of long siesta after lunch. The view from my window was… read more spectacular! It is impossible to not be happy waking up to that every morning!! The work was well-structured and pretty easy, five hours a day in total, mostly restoring old furniture and sometimes various cleaning/housekeeping tasks around the place as needed. We were fed extremely well (I gained a few pounds! ;_;) and the nuns always made sure we were well-rested and not overexerting ourselves. The people... where do I begin? This monastery is simply bursting with positivity and goodwill. The nuns are some of the sweetest, loveliest, most gentle and affectionate beings, and even though most of them don't speak English, I was able to feel their love and care for us, through their incredible hospitality and kind gestures. The locals who help there, Guidi, Stefano, and Vladimir, too were full of warmth and kindness. And the other volunteers, although we only spent a short time together, there was an intuitive rapport among us such that we became instant friends. i is a very friendly, sweet, responsible, open minded girl who turns out to be also very moderate. She is a hard worker and faces any new tasks cheerfully and passionately, whether she has to work with carpentry (she mended and painted so many chairs!) or to tide up in the monastery. She fulfilled every task by working calmly, thoroughly, and… read more reliably. 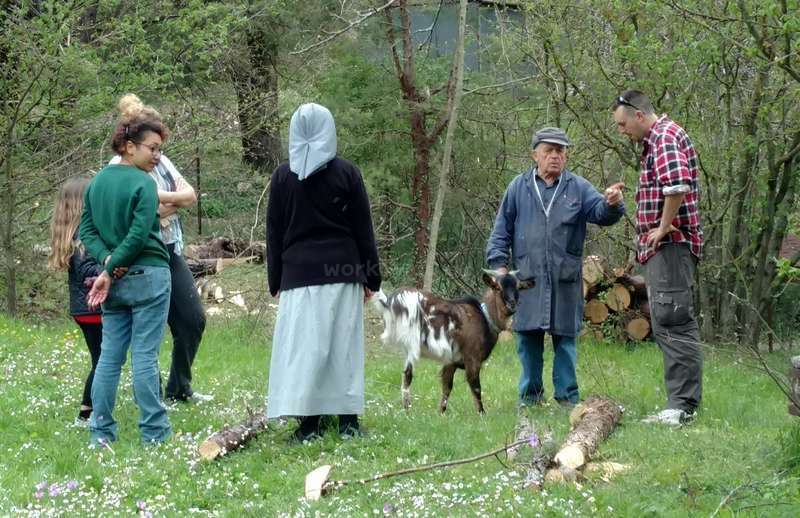 She was a positive and pleasant guest of the monastery, appreciated by everybody and was able to establish good relations with the other workawayers. Besides working and dining with them she spent time teaching them the art of origami, she is really very good at creating such gracious little animals! We often found the other workawayers attending Yi’s lessons of origami, she was very patient in explaining them all the steps to fold the paper. Thank you very much Yi for spending some time with us! including volunteers. By the way, volunteers in the monastery are nice and affable people as well. To be honest, I’ve never met so many good and kind people in one place and it is amazing feeling, when you are surrounded by such warm atmosphere. This place is more than just work in exchange for food and accommodation. It is also a spiritual exchange, and I feel that I received more than I could give. I am very grateful for everything. I hope I will return to the monastery one day. Thank you so much, I send you my gratitude and best wishes! Anna is young but very independent, responsible and respectful almost to the extent of looking shy. She worked with passion and great care in the details and contributed to a friendly and cheerful atmosphere with the other workawayers, with whom she came in contact very gently. She always tried to establish new relationship striving to speak… read more Italian, something we greatly appreciated. We wish you well, Anna, we are very grateful! Alfonso and Tamara (they spent 15 days with us) are a mature, well mannered couple, very good at correctly interpreting any situations, eager to cooperate with and engage the other workawayers,, always paying attention to other people’s needs. They were always helpful and worked with accuracy and reliability. They are a nice couple, they like to… read more think things over and to raise questions about what really matters in life. 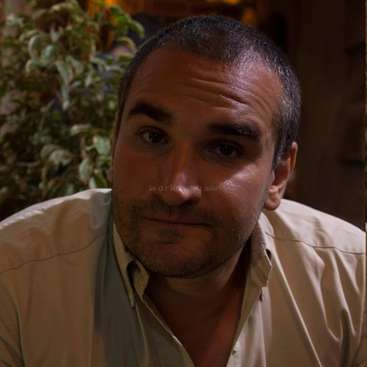 We thank Alfonso for his tact in helping as an interpreter and a tutor in English and Spanish. We thank Tamara for working gracefully and enthusiastically, always with a smile on her face! We started our Workaway experience with Argentinian friends and we are happy to end the season with two new friends from the same country! We spent two weeks at this monastery and honestly it was an absolutely wonderful experience, enriching both from a spiritual and a human point of view. The nuns are incredibly kind, open and helpful and went out of their way to make sure we had everything we needed , from comfortable and clean accommodation to excellent food (our regards to Paula,… read more the cook, who makes the best pasta we've tried, right "al dente") . Lucia, Mother Laura, Mother Battista, Erica and all the other nuns were always there when we needed them and at the end of our stay we had a wonderful meeting in which they told us about their daily life and their spiritual path. It is truly refreshing to meet people who live by such standards and make of work and prayer a way of serving God. I recommend going to see the nuns sing at Vespers: it is a peace-filling, relaxing and truly spiritual moment. The volunteer tasks were fair and enjoyable, and we learned plenty of new things - from techniques for furniture restoration to painting and repairing walls. Fabriano is a beautiful town and not far away from very interesting places, such as Assisi or Perugia. We already miss the nuns from the monastery and wish them all the best . Lindsey spent a month with us and we were able to share with her much more than we could ever imagine. Lindsey is really special, she is incredibly tenderhearted and easygoing: she never avoids any tasks and always works with accuracy and precision; she is friendly, cheerful, she easily make friends with everybody and she is always grateful to… read more everybody and for every little things she receives. She established very good relationships with her fellows workawayers and went on weekend excursions with some of them. Her engagement in tutoring the nuns with English was especially valuable. Being very fond of Italy, Lindsey came to us with great enthusiasm and willing to be involved in new experiences, including our monastic life, therefore she joined us in our prayers whenever she could. Therefore we have been able to build a very strong relationship and we hope she can come back soon. Thank you Lindsey, we will be waiting for you! Where do I begin? This has been the best experience of my life. I could not have asked for a more welcoming, loving, comfortable environment. The monastero and all of the nuns will forever be in my heart. I have never known such happiness, peace, patience, and generosity as I encountered here. This goes above and beyond the expectations of a… read more workaway. The monastery becomes a home for you, and the nuns are the sweetest people I have ever met. When I was cold, they lent me warm clothes. When my Workaway plans changed and I needed a place to live, they let me stay longer. When I had questions about the monastic life, they answered them with love. When I was sick, they took care of me and accommodated my food allergies with such love. I could talk for hours about how these women opened their doors for me and invited me to pray with them and talk with them. This is an amazing opportunity even if you are not religious. They welcome people of all backgrounds and faiths. They are genuinely eager to get to know you and to make you happy. They understand that Workaway is a balance of work and cultural exchange, and make the experience so positive for their volunteers. In the time I was there, they took us to a nearby farm twice, organized a private tour of the whole town, etc. They are very organized and have an easy-to-follow schedule (3 hours in the morning and 2 hours in the afternoon), but will usually let you choose which hours in the afternoon you would like to work (for example, 2-4 or 3-5). The work is enjoyable--sanding, painting, and occasionally gardening or cleaning. They give you everything you need in order to complete a task. Guido, Vladimir, and Stefano, the employees who work on a majority of the carpentry projects, are an absolute delight, as well. Stefano took us on many adventures in our free time, which was amazing! On weekends, you are free to go wherever you please. Fabriano is a beautiful and quiet town. Assisi, Senigallia, Ancona, etc. are all close destinations, or you can easily make a weekend trip to Rome, Florence, Bologna, Milan, etc. But, some of my favorite days were spent just resting at the monastery! The accommodations are astonishing...your own bedroom in a beautiful guesthouse, 3 delicious meals a day (lunch and dinner are more formal meals, and they provide fruit and biscuits for breakfast), and on many occasions, they give us treats (pastries, gelato, etc.). The food is never lacking, and they use fresh vegetables grown in their garden! They do your laundry and always make sure you have fresh sheets and towels. The guesthouse is fabulous, especially when you are working with other volunteers from all over the world...the ground floor becomes a place where every language is spoken and you can all listen to music, make tea, and sit and laugh together. It is always fun wjsn Lucilla comes by to chat, too! Madre Laura is so kind and understanding. They are all such amazing and sincere people, and have so much wisdom and love. I received the opportunity to meet and interact with each one. I will never forget the memories I made here, and I will be forever grateful for this experience and how it has changed me and filled my heart with peace and the Love of God. Thank you, Madre Laura, for everything. Thank you to all of the nuns for your friendship and prayers. We will be close to each other in prayer! I will write to you when I arrive home! My experience working in the monastery was awesome. :) Really. The words are never enough when the experience has been wonderful. The guesthouse is very clean and tidy. The nuns were always welcoming and it was a comfortable environment. On weekends, you are free to go wherever you want. Fabriano is a beautiful city. And near Fabriano you have Assisi, Loreto, Senigallia, Ancona, San Marino, etc. Or you can make a weekend trip to Florence or Rome. But, believe me, the best is staying in the monastery. That part is what I am missing more than others. Before arriving at the monastery, I knew that the experience would be good. What I did not know, was that it would be SO good. Blessings in all the work in the Monastery. Gonzalo mingled very easily in our monastic life thanks to his nice personality, his calm, positive serene and contemplative attitude and his very many questions. He got on quickly with every workaweyer with our guest and with us, also given his good Italian... except when he had to undesrtand Guido's way of speaking... (Guido is our funny senior… read more voluntary). 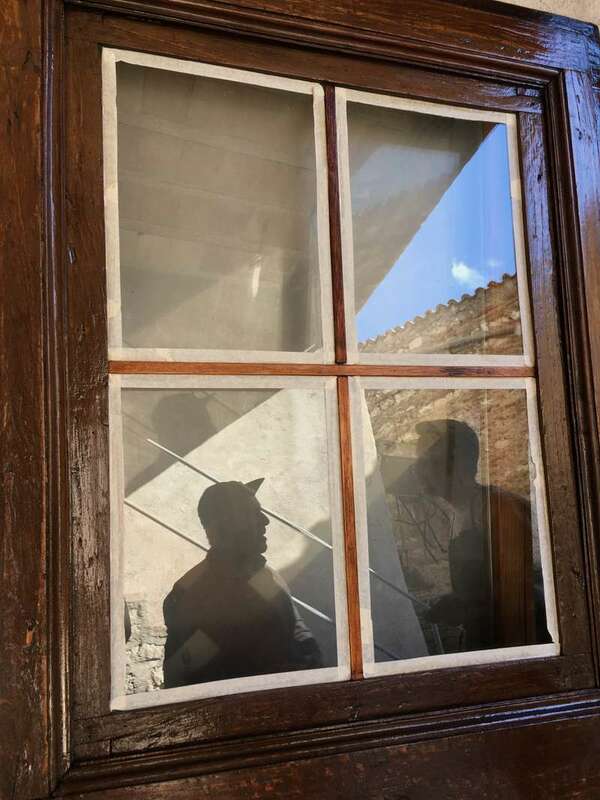 Gonzalo had the task to mend 19 windows in the monastery and he fulfilled it quietly, patiently and the confidence we put in him has been very well repaid. In addition to this task he worked also with the other workawayers (to other windows, in the garden, farming) always smiling and ready to help (he proved to be the perfect mate for pics and selfies!). We beacame good friends since he was very interested in knowing our Christian experience in depth. Thanks from the bottom of our hearts, we wish you the very best! This place is more about love than about work. So many times I thought that we, volunteers, just don’t deserve such kindness. We worked much less than we got in return. Nuns and their nice guests are extraordinary sincere and friendly. And sister Lucia is the most bright person I’ve seen in my life. Thank you once again for everything, time… read more spending here was very special and important time in my life and I enjoyed every minute of it. I wish to come back one day (hope till that day I’ll learn italian to speak with you fluently). It’s so hard, quite impossible to write any rational feedback for you, so I better send a lot of love to everyone of you and to this beautiful place! Varvara has been with us for more than two weeks, and we got on really well with her. She proved to be very easygoing and very reliable in any work she was assigned. Moreover she proved to be very reserved, quiet and friendly. We are really impressed by Varvara: in addition to working as workawayer in our monastery, in her free time she was… read more often busy to pursue her own work of writer-screenwriter: she loves her work and at the same time she is very open minded, with a sincere desire to know new people and new places. Thank you so much Varvara! 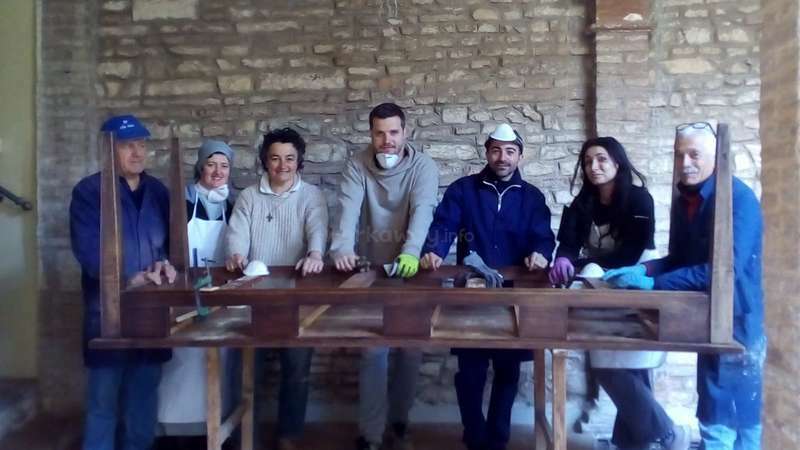 I wholeheartedly share in all the previous posts that so eloquently describe the volunteer experience at Monastero S. Luca. This was my third visit to the monastery and every visit is transformative in terms of just taking a step back and having time to really think about what’s important in life. Each year I look forward to returning to become… read more part of a very special community, with the sisters, staff and other volunteers. To Madre Laura and all my other sisters, thank you for welcoming me into your hearts and home. Previous feedback - This was my first workaway as well as my first solo trip to Europe. The experience exceeded all of my expectations. During my two weeks I felt like a valued member of this community of sisters, staff, guests and other volunteers in a way that was very special and fulfilling. 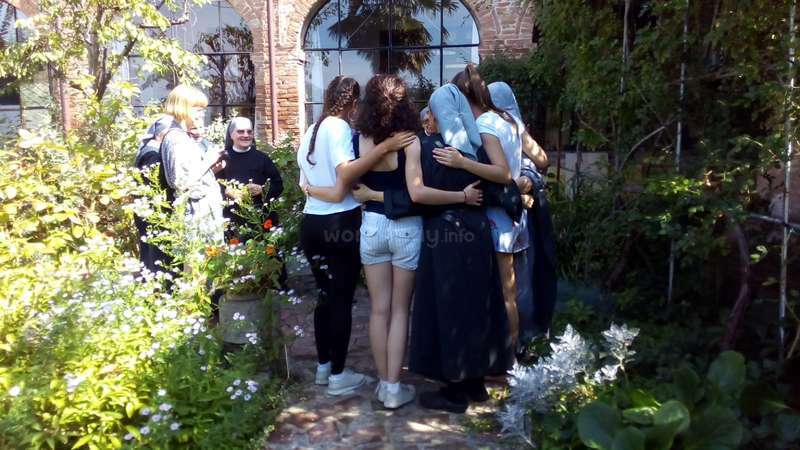 The sisters extended every kindness to me and the other volunteers, making us feel appreciated as individuals as well as volunteers to help them with projects to maintain and restore this beautiful historical and spiritual oasis in the heart of Fabriano. The sisters are very organized and you will know your tasks for each day and have the necessary tools and instruction to complete them. There is also a lot of variety, which makes things interesting. Some of the tasks I worked on included sanding and staining window shutters and doors, treating furniture for woodworm, painting, a little weeding in the garden (the gardens are beautiful) and cleaning out a garden room for an upcoming event. Most of the time I was paired up with another volunteer. I especially enjoyed the afternoon we went with several sisters and staff to their small farm outside of Fabriano to harvest walnuts. While you may not have the pleasure of meeting and interacting with all of the sisters, everyone is friendly and open – even to a non-Italian speaker like myself! But somehow we were able to communicate and enjoy each other’s company. I also had the pleasure of meeting and getting to know some great workaway volunteers, Ana (Croatia), Gonzalo (Argentina), Lindsey (US) and Sophie (US). We had fun together exploring Fabriano and taking day trips to Assisi and Rome. The monastery is close to the train station making it easy to travel around the region during free days. I want to send a special thank you to Madre Laura, Monacas Lucia, Gabriella, Teresa, Frederica, Madre Batista and all the sisters for their warm hospitality and friendship. Grazie mille. Barbara chose to come to us as her only destination for her journey from the Usa and we are very honored for that. She is a special woman, very energetic, very optimistic and sunny person, and she easily takes on any task, showing accuracy, attention and punctuality. She likes being among people and she contributed largely in creating a good… read more atmosphere especially with the other workawayers, (although of different ages) and she has become a point of reference for all. Even if she speaks only English she can communicate with anybody thanks to her expressive and extroverted personality, therefore in the guest quarters and during work she spread cheerfulness with her contagious and irrepressible laughter. A very meaningful presence for these times in our monastery. Thank you very, very much Barbara! Ana spent almost two weeks with us. She is very elegant and well mannered and she adapted herself with simplicity to any tasks she was required to accomplish, from cleaning to carpentry, always paying attention and being precise in her work. Abigail arrived at our monastery’s door with a violin, a small backpack and her great determination to communicate. Always trying to communicate in her simple but effective Italian, Abigail succeeded in establishing strong bonds with everybody. Surely the best way she has to communicate is her violin (she plays with competence and great… read more sensitivity), thanks to her music she expresses herself at the best and creates a friendly atmosphere all around her. She is young and very strong, she can perform any works and she has adjusted herself to different situations with discretion. We wish you all the best in your new job, always in the swing of things! I had a wonderful time staying at the monastery. I stayed for two weeks; the first I was mostly on my own, as there weren't any other workers for much of it, and the second week I worked with a lovely woman from Croatia. The work was easy, and enjoyable, and fairly varied. I cleamed in the guest house, painted, washed windows, swept and tidied the… read more garden, helped a bit in the kitchen, de-wormed furniture, and cracked a bunch of nuts! There was plenty of free time, and I was able to catch up on writing emails, and journaling. Meals were delicious and delivered promptly and with many smiles from Sister Lucia, and the room I stayed in was very clean and comfortable. Fabriano is a sweet little town, very tranquil. The nuns are all amazing, and I adored them! Very quick to smile and laugh, engaged, so kind, and with a calming presence. They were very accommodating too, helping me send some forms during a stressful job application process, and lending me some work clothes (mine were lost in the poste). Also, when I stupidly spilled a container of dark brown wood varnish on a white wall, they were very understanding and forgiving, which greatly helped assuage my guilt. All in all, I had a wonderful time, and am SO appreciative of all that they did for me. Sorelle e Madre Laura, grazie mille per tutti! I will write, and hope to visit again in the future! Bettina was with us only 10 days, but in this brief we found her to be cordial, sensible and a reflective personality. Bettina was particularly interested in dialogue, despite our difficulty in speaking English with fluency. She enjoyed learning and having new experiences. Because of this the other guests in the monastery with whom she shared… read more meals got along well with her. With regard to work she was always very efficient and responsible in carrying out the tasks assigned to her, both with the other workawayers and also with us. Her stay with us was very positive and pleasant. Lea was a delightful presence among us, and she adapted to the monastic daily routine with great ease and also thanks to her interest in learning the Italian language and culture. She is still quite young, but at the same time she was very determined, polite, respectful and open to learning new things, as well as having a great sense of… read more humor. With regard to interpersonal relations, Lea was attentive and affectionate to the monastery guests, with the other workawayers, and also with us. She gave particular attention to one of our older nuns, she never forgot to give her a special greeting, a smile and a kind word, both in the mornings and in the evenings. She shared with us some important moments (prayer) throughout our day, and this was very precious to us. With the other workawayers, she maintained a spirit of cooperation and always participated in whatever work was being done with seriousness, calm, and precision. Thank you Lea for your presence among us and your friendship! I arrived at Fabriano in pouring rain when Mother Laura whatsapped me they would come to pick me up from the station by car. This was the beginning of two wonderful weeks: The nuns are incredibly caring and cheerful people. I have learned a lot from them and I admire their sense of serenity, their down-to-earth attitude and their deep respect for… read more the earth and whatever lives on it (except woodworm, most probably). Tasks are done following the concept "Lavorare è bello": All tasks were fun, interactive and precisely explained (or shown whenever I did not get it in Italian): I repaired chairs and tables, did some painting, helped in the pottery studio, joined for potatoe harvest... the long lunch breaks and no work after 4 pm opened up time for countless espressi with the other workawayers and guests, reading and relaxing in the beautiful garden or going for a walk in town. Plus, the nuns are happy to share their spiritual life (without being pushy on that!). I feel privileged they let me join for their daily prayers and answered all my questions on monastic life. Also thanks for your patience with my Italian! I promise to work on that before I return next year... you are deeply missed! I stayed for almost two weeks and it was a fullfilling experience. The location is beatiful. The monastery is a homely sanctuary of tranquility nestled in the heart of Fabriano, which is a nice small town that can be easily explored on foot. Although there are many tasks you can do, during my stay I only helped to paint the attic. Everyone is… read more very friendly and kind and they will make anything to make sure you have a wonderful stay. The food is amazing, it is impossible to be hungry at any time. I'm really going to miss sister Lucia arriving with il carrello. Thank you to madre Laura and all the nuns for making this experience unique. Thanks for your big smiles and enthusiasm displayed everyday. I will definitely come back next year. Emma is a very special young lady, incredibly lively, sensitive and nicely funny! During her two weeks stay with us she proved to be discret and respectful, showing great concern towards everyone she met and great ability in establishing deep and welcoming relationships with everybody. She immediately was in sync with all the nuns either the… read more young ones or the senior ones. Her attitude was crucial to create a positive climate while working or relaxing with other workawayers. She befriended everybody in the guesthouse and she established strong relationships that last on. She was very interested in monastic life and she shared some very important moments with our community. This led us to established very strong and friendly bonds with her. Emma was always available and ready to fulfill every task with responsibility and accuracy In her work. She worked in many different fields (gardening, woodworking, working with iron, pottery, house cleaning) and being such a lively and positive person she had no problems in acquiring new abilities. She has truly been a meaningful presence for us. Thanks you so much, Emma, we hope you’ll visit us again soon! I have thoroughly enjoyed my stay in Fabriano. Firstly, it is a 'beautiful' small, historic and cultural place. Also, the 'monastery' is a very lovely place to be because it has a 'peaceful' and 'calming' ambience and it is a very 'charming' and 'pictureque' place. However, the lovely atmosphere is cltivated and created by Mother Laura, Mother… read more Batista and all the sisters because they are the most: welcoming, warm and caring individuals I have had the privelege to meet. Furthermore, the 'beauty' of the place is excelled by the 'pleasantness' and 'kindness' that the Sisters exemplify in tbeir day to day interactions with one another, guests and workaways. I also enjoyed learning about the Benedictine way i.e. 'prayer', 'work' and 'hospitality'. I found it a pleasure to 'worship' and 'work' with them and I feel that being a workaway here was a very 'positive' and 'life enhancing' experience which I shall always treasure and build upon. The work that I did was varied and interesting i.e. sanding and painting a well, gardening, cleaning, treating chairs to eradicate woodworm, assisting with pottery work etc. I found it satisfying to know that my small contribution was of help to the Sisters and they were always on hand to give 'instruction and guidance'. Also, in the first week Guido and Amelia were really great in inducting and instructing me on what to do in terms of work duties. They, are both very lovely! Additionally, if it was very hot the Sisters would always tell us to take a break and give us juice and water. I also think the hours are fair I generally worked from 9 am to 12 and then resumed work at 3 pm to 4 pm. As, a workaway here you are treated with 'respect' and 'dignity'. You sit and have your lunch and dinner with the guests which I enjiyed because it is a nice and social experience. It is also a good opportunity to learn more about Italian culture and try to learn some Italian words and phrases! I must also add that the Sisters are not only verh 'hospitable' to the 'guests' but also to the 'workaways' as they are very friendly and caring. They, look after you by making 'delicious' Italian cusine every lunch (pranzo) and dinner (cena), they are happy to do your 'laundry' for you if you wish and they are very approachable so if you ever neex to talk to them about anything you can. I wish to thank Mother Laura, Mother Batista and all the Sisters for being so 'warm' and 'welcoming' to me. This, also includes Sister Frederica! Also, Signore Guido and Signora Amelia! I fe very 'lucky' and 'blessed' to have come here and meet such 'wonderful' people. Joseph and Lisette are a nice well-matched couple who stayed with us two weeks sharing our way of life. They were interested in knowing new things and people therefore they were available and careful from the very beginning. Whoever got in contact with them got on very well because they are both very kind, calm and serene, always ready to listen… read more and know everyone they met: nuns, workawayers and guests they shared they lunch with in the guesthouse. We are not fluent in English yet, but they proved very patient with us trying to speak slowly so that we could understand better. Thank you, we appreciated that very much! Joseph is a hard worker, very flexible and skilled; Lisette is very reliable and precise in working with details, excellent in refining: they adapted promptly and easily to any tasks (gardening, wood working, iron painting, wall painting) and they were precious in helping us with the maintenance of our monastery. Thank you so much for your time and your respectful friendship. We wish you well. If you come back to Italy, we will be here to wait for you! This was my first workaway experience. I could not have chosen a better place to stay. The sisters are very kind and help you in everything they can. The work is varied and entertaining, and for me, the experience of helping in the conservation of the monastery has been most satisfactory. 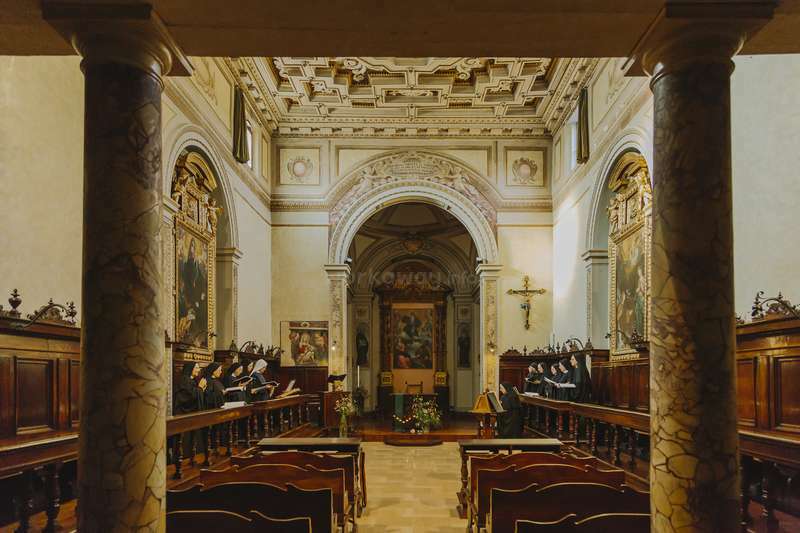 The monastery is in Fabriano, a beautiful town where you… read more can visit, for example, a museum where it is explained how the paper was made at its beginning. 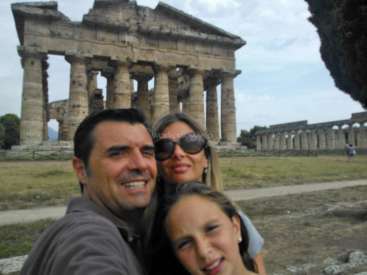 The experience also gave me the oportunity to meet a lot of different people and learn about the culture in Italy. Thank you every one for the experience and all I have learnt in this trip, and thank you Laura for giving me the opportunity to learn new things about my degree. It has been a pleasure to stay in your monastery. Alvaro is a kind, trustworthy, reliable young man. During his stay with us he was of great help in working together with others at painting and he fullfilled every task precisely and respecting his deadline. He socialized very easily with the other workawayers and was very respectful to the guests. He has had the chance to get a glimpse of Italy… read more before starting university in Milan. Since he will be staying in Italy for a while, we hope we'll meet again ... in the meantime thank you very much and good luck! I spent a beautifull time here .Its a great comunity of people and it was beautifull for me to share with the sisters and others Workwayers. All the tasks were possible to perform and clearly explained ( painted and little gardening in my case). The place is nice and peacefull and sorrounded for many interesting locations. Thanks for having me and… read more the patience to teach italian. Ho passato io momenti maravigliosi , si tratta di una grande comunità di persone.E´stato bello per me condividere con le sorelle e´altri workwayers. Tutto il lavoro (nell mio caso vernice) erano possibile fare e chiaramente spiegato. Il monastero è bella e tranquilla ed è circondato da luogui interessanti. Grazie per avermi e avere la pazienza di insegnare l´italiano. Carlos was at his first experience as workawayers and arrived at us directly from his homeland, Chile, coming to Europe for the first time. He was very eager to know everything of the new enviroment he had plunged into, and he put much effort in learning Italian as well as in working for us. He fullfilled the task of painting and gardening with… read more competence and professionalism. He was ready to help also with specific consultancy in the field of beekeping and he disclosed to us some of the tricks of the trade! He had no problems in socializing with the other workawayers and the guests. We hope there will be soon other occasions to meet! All the best, Carlos, and thanks a lot! During her stay at the monastery Amy was an active worker and did some carpentry by painting and sanding some of the doors of our cloister. Moreover she is an excellent English teacher and was very patient in giving lessons to some of us: in fact in the afternoon she devoted herself to teaching using a very interesting method, that made her… read more lessons useful and pleasant at the same time. She is a very open minded person, very optimistic, intense and always ready to establish new relationships. We had a great time with her, it was a very rich cultural exchange. Thanks a lot, Amy! Staying at the monastery was such a wonderful experience for us! Our work was varied – Martin worked with Stefano (a sweet, big-hearted local who helps at the monastery) every morning painting one of the many outdoor corridors while I worked with a few other workawayers sanding and painting doors, and then Martin joined us in the afternoon. I also… read more worked in the refectory – where they traditionally eat – renovating the platforms. We had some fun working around the language barrier (though Mother Laura and Sister Lucia both speak some English), overall things are easily shown and explained, and we got to learn some Italian in a great environment. Our hosts were overly generous with making us feel completely comfortable and giving us the option of flexible working hours in case we wanted to travel certain days, otherwise the agreed upon hours were 9-12, with time for lunch and a siesta, then again from 3-4pm, Monday-Friday. Delicious food was provided by them and eaten family-style with the other guests and workawayers for lunch and dinner. We slept in a room with two twin beds and had our own bathroom across the hall, and ate in the guest house, just across the courtyard. We explored the cute town of Fabriano on our time off and went for a hike in the hills one day. Dear Jeana and martin, thank you so much for sharing your time with us not only as workawaiers! In addition to being excellent, accurate and punctual workers in the maintenance of the wood and painting, Jeana and Martin have always been available, open, friendly, kind, reserved, reliable, careful with us and with the other guests with whom they… read more have shared part of their day. Thank you for your friendship and your help! The Monastery is located just in the center of Fabriano, a small lovely town in the center of Italy, between Umbria e Marche. 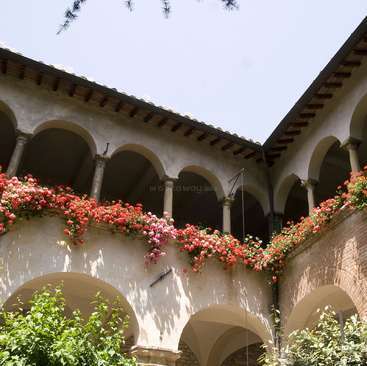 Is a big Benedictin Monastery, with a wonderful garden and a cozy guesthouse. The nuns are… read more very kind, friendly and really hospitable and they do all that they can for provide a very pleasant stay. They are some of the most heplful and generous people that i met in my recent life: I spent two weeks with them and I enjoyed every single moment of my stay... I'm just back and I already miss them. The daily work is very light and funny and gave me the opportunity to learn something new about painting and wood working. I also had lots of freetime to enjoy the beautiful surroundings. Thank you to Mother Laura, Lucia, Erika, Erica and all the others nuns for opening to me and to other people from everywhere the doors of this wonderful place. Great workaway opportunity! I had a very pleasant stay here. The nuns are very friendly, hospitable and relaxed, the work I did was very nice, too! It was mainly smooth things like sanding and painting furniture. The monastery itself and the garden are beautiful and you will get good accommodation and excellent meals there. 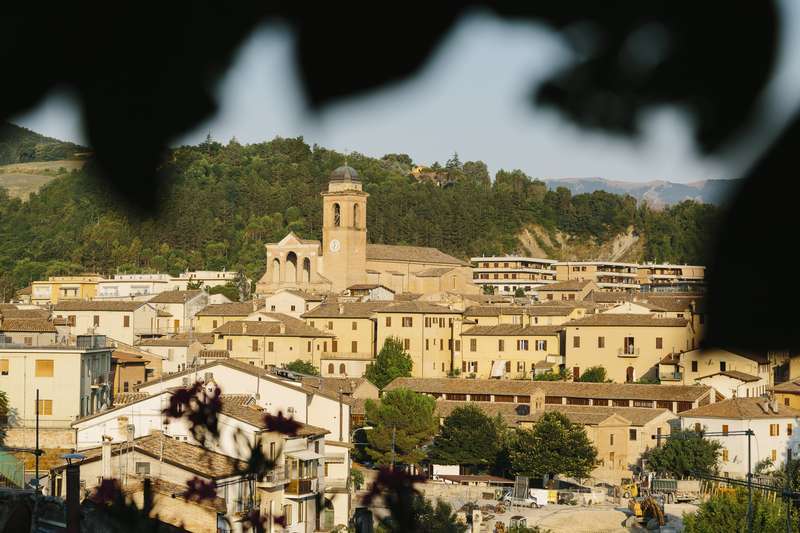 The town of Fabriano is… read more nice but small and quiet, so it´s definitely more a place to come when you are looking for some calm days. Most of the nuns don´t really speak English, but we always found a way to communicate anyways. Thanks again to Madre Laura , who was very patient with explaining me things until I could understand them! Mille grazie for everything!! Hanna stayed with us only 10 days but she proved to be invaluable for her availability and patience, especially regarding all her woodworking projects. She was reserved, mature, autonomous and trustworthy. An excellent workawayer! Ana Clara and Santiago were our first workawayers and we couldn't have gotten better ones! They were very organized from the beginning, from their initial conctat communications to their every assigned task with us: gardening, sewing, painting and wood working. They are both very responsible likeable, careful, reserved and easy to get along… read more with. We immediately established a warm rapport with them, and they shared their global travel with us trought photographs and stories. These 15 days together have been very rich for us in the monastery: offering us interesting opportunities to learn new things. Many thanks and we hope to meet again soon.